Sooke salmon fishing has been decent lately. 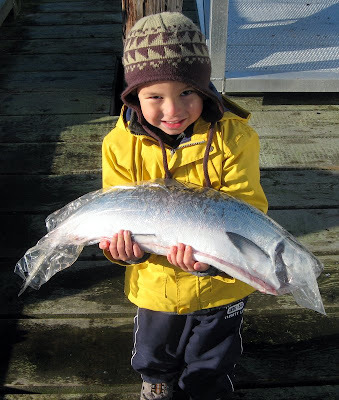 Most salmon caught are in the 5-8 pound range, but there's a few up to 15 pounds like this one caught by the Salty Towers crew. The usual winter spots have been good from the Bluffs to the trailer park, but some anglers have had success off Possession Point towards the harbour mouth. There is an important meeting in Langford next week regarding the halibut fishery for 2011 -- see below. The totally inadequate, biased and unfair allocation system in place for Canada’s Pacific halibut is about to create a short season disaster for local anglers. Come on out to hear the facts at the Victoria Town Hall meeting on Wednesday 12th January 2011 at 7:00PM (In the West Shore Ballroom of the Four Points Sheraton Hotel, 829 McCallum Road, Langford - behind Costco). Join us to find out what you can do about it. Halibut is the concern today, but other species (salmon, groundfish, crabs and prawns) are scheduled for the same treatment by Fisheries and Oceans…. We all need to send a very strong message to the authorities immediately that this is unacceptable. Guest speakers will outline the issue, a panel representing several segments of the public fishery will give their perspectives and there will be an open mike session, where you can ask questions and offer your comments. Come on out and join us, bring a friend, this may be the most important contribution you make to the future of fishing for all of us. OR BE STOOD UPON FOREVER!